In this post, we are going to discuss on the applications of vectors - Finding Ratio of Areas. 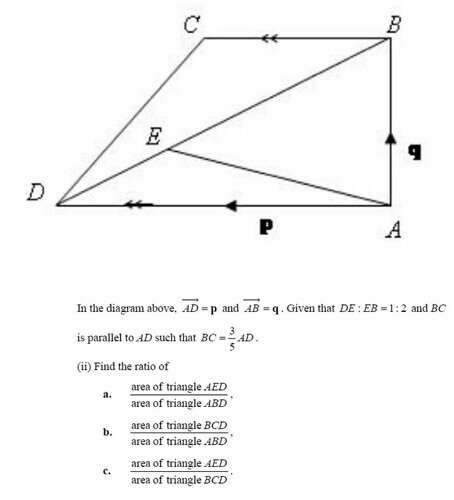 This is a popular section in examinations and based on my many years of experience, students simply don't like it due to many of them disliking and not making sense of the topic on Similar Triangles. In Similar Triangles, the ratio of 2 similar triangles can be easily found by squaring the ratio of their corresponding length. I am going to use this examination question below to illustrate the application of Strategy #2. This strategy works when the triangles shared either a common base or a common height. And that the triangles are not similar. Watch the video below to find out if your answers are correct. Included in this video is a trick which will help you to 'see' your answer faster! Rate the video or leave me a comment or question. When strategy 1 or 2 do not work and the question involves repeated triangles, overlap is the strategy you can apply. Overlap involves equalizing of ratio of THE triangle which overlaps. Very nice video which I think is a very useful learning tool for student. Just a minor correction on the last part (strategy #3), you've written wrong multiplier for the ratio of ABD : BCD. Instead of 5x3, you've written 5x5, which might cause a little confusion for viewers. Your narration is correct though. I appreciate you in pointing out the error. I will correct it in my video. I am still learning on how I can make my video clearer. Seems like the text is a little unclear. Any suggestion? By the way, you have an interesting website! Well, I think the text is clear enough. When I compare the text in your videos, it seems that the unclear text is usually the questions, which I guess is a scanned image from the hard copy. Perhaps you can try scan them at a better resolution then. I'm not sure what screen recorder you are using, perhaps you can also tweak the settings of the recording. I'm not an expert myself, but these are just some suggestions I can think of. I'm not from Singapore but is now in Singapore. This is really good question. In fact, the common misconception many students might have too! I will answer this question by Sunday if nobody responds. Those who know the answer to huaan question, please leave your comment. "You learn best by sharing what you know"
We are not using that because the triangles are not similar..We use A1/A2=(l1/l2)^2 .. only when the triangles are similar..
how do you know the height of the triangles of the same? for both part (a) and (b), i cannot tell whether the height is same or not. Height of a triangle (used in finding area) must be perpendicular to its base. Greetings! I WANT TO CLARIFY. How do we know/assume that angle DAB is a right-angle which leaves us to conclude that the height of BC is = to the height of BA? THANKS! We need to see the diagram before deciding if the triangles are similar. // lines don't necessarily equate to similar triangles. Are you referring to triangle BCD and ABD? If so, if we were to consider the base of BCD to be BC, the perpendicular height is the distance between the pair of // lines BC and AD. Similarly, if the base of triangle ABD is AD, the perpendicular height is also the distance between the pair of // lines BC and AD. There isn't any assumption that angle DAB is a right angle. thanks for this share.What to do if area of triangle to area of quadrilateral ratio is told to found out.Please help.